The vast majority of people consider comparatives and superlatives in English easy. They usually have no problems with their formation and as there are very few exceptions, they master this grammar point pretty quickly. However, it is still a good idea to have a few interesting activities up your sleeve to teach this well. You can find the basic explanation and infographic in my previous post about comparatives and superlatives. In this post, I am going to offer three activities that worked very well in my classes. The first one is a simple pair speaking activity to practise the comparatives. The second one is called Hidden picture and your task is to colour the correct sentences and find the hidden picture. The third activity is a video quiz with a writing activity. I hope you will like the activities and use them in your classes too. For the first activity, you will need the following worksheet. Print it and ask your students to work in pairs. Give each student one quarter of the worksheet. Make sure to give different worksheet to each student in a pair. Students should fill in the gaps using the correct form of the adjective in the brackets. Check their answers. Even though the questions are different, the answers are the same and therefore, they are easy to check. Then students work in pairs and read the questions to their partners and answer them in English. For the Hidden picture activity, you need to print the following table for each student. 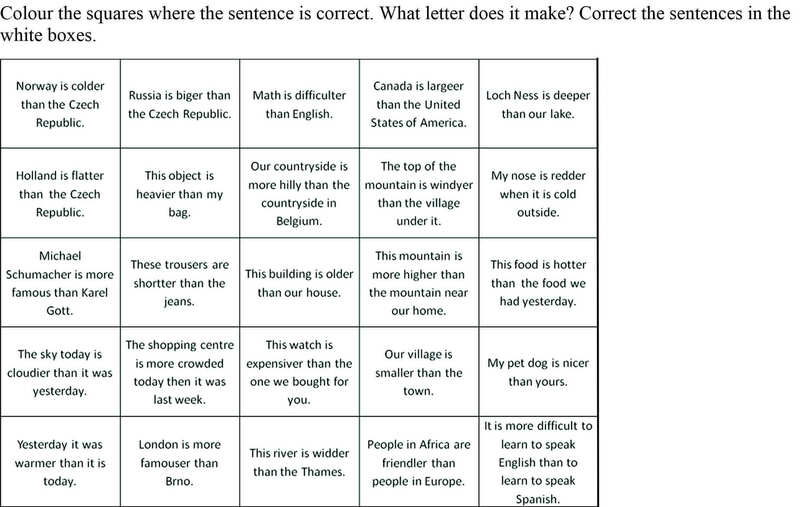 Ask the students to colour the squares that contain a correct sentence. If they do it correctly a picture will appear (in this case the letter N should appear). Then go through the sentences with your students and elicit the mistakes and their corrections. Before you play the video, ask the students to take a piece of paper and something to write with. Play the video and the students write down the correct answers to the questions. At the end of the quiz, they check their answers. Award the student with most correct answers. As a follow-up activity, it is a good idea to ask your students to write a similar quiz.